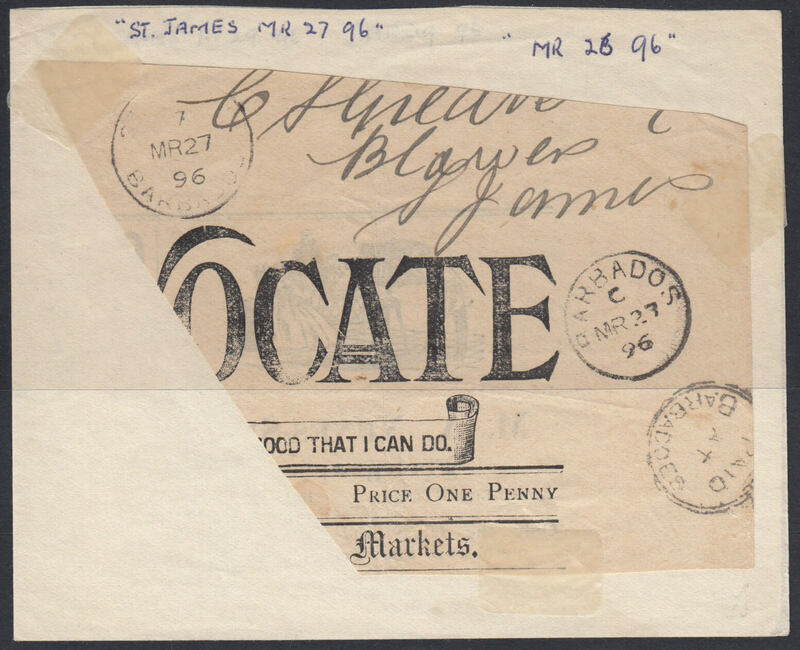 Home / Barbados Postal History / What was commonplace in 1896 but a rarity now? Sometimes, we take what we have in front of us for granted. Take for example, the post that comes through your door today. How much of it will be in pre paid envelopes with Royal Mail or other mail provider indicia on them instead of stamps? And how many of those envelopes will be consigned to the recycling bin? The answer, I suspect, is most of them. There are so many of them they have become commonplace but if you look carefully at them you will see that there are a great many varieties and these are collectable. Yes, even today there are collectors who are looking for the very thing you consign to the recycling. The same held true back in 1896. Back in 1896 people had newspapers delivered daily and Barbados was no exception. The newspapers, printed in Bridgetown, were distributed across the island by means of attaching a stamp to a newspaper wrapper which contained the newspaper inside it. On receipt, the householder would remove the wrapper, throw it in the bin and read the newspaper. Today, finding a newspaper wrapper with a stamp on is a very tricky matter or, indeed, a newspaper masthead with the stamps still affixed, as sometimes they did this instead of using the wrapper. Even rarer I would suggest is the item shown above. It is a fragment of a newspaper masthead from 1896 but importantly, this was from a short period when the island had a shortage of ¼d stamps, used to pay the postage rate for newspapers at the time. This shortage lasted from 23rd January to 4th May 1896 and during this period, instead of affixing a stamp it was agreed that newspapers and wrappers could be cancelled using the old ‘Crowned Circle’ canceller, originally used to cancel outgoing mail before stamps were introduced. 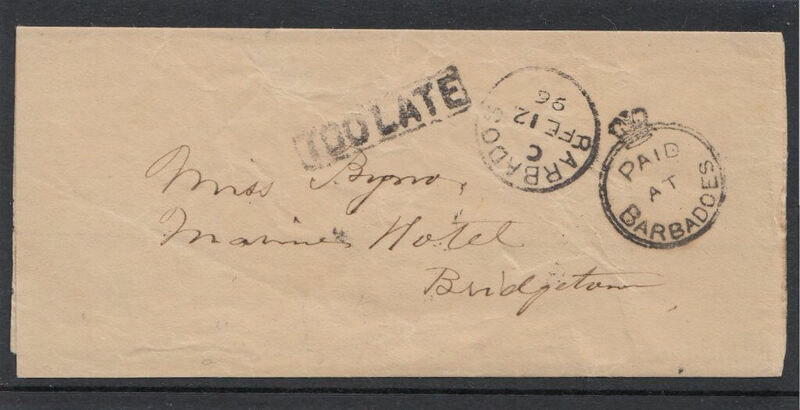 In my collection I have just one example of this usage on a newspaper wrapper and this is itself an incredibly rare item as it shows ‘Too Late’ hand stamp as well. The newspaper fragment shown above is therefore an extremely rare item as not only does it show another use of the Crowned Circle canceller, it also has a St James’s cancel as well as a standard GPO cancel. To make sense of these cancels we need to understand the sequence in which they were applied. First, the GPO would have cancelled with what appears to be a standard GPO date mark ‘MR 27 96’ showing that it was posted on March 27th 1896 and the letter C indicates that it was posted at 2.30pm. The ‘Paid at Barbadoes’ Crowned Circle cancel would then have been applied once payment had been made for the delivery of the newspaper and it would have been sent up the West coast to St James. On arrival it would have then been cancelled with the date stamp to prove receipt and from there it would have been delivered to the householder to whom it was addressed. Finding a copy of The Advocate, the principal newspaper on the island at the time, with these markings on would be a very rare find so finding this fragment is equally as important. And it’s amazing to think, that during this period of January to May 1896 thousands of these newspapers would have been delivered in this fashion, yet today, virtually none exist. So, think twice before you throw your next piece of ‘junk mail’ into the bin. You could be throwing away tomorrow’s Postal History.